The days of your reception being nothing more than a desk and an administrator are long gone: guests to your business will expect a friendly, welcoming and comfortable environment. Your reception offers you the opportunity to tailor your first impressions to match your company's image, and you can never underestimate the long term importance of a good first impression. There are a huge variety of options available to guarantee that your reception sends the right message to your guests. whether you want your space to be modern or traditional, formal or informal, private or open - we have options to suit everyone. Your choice of desking, seating, lighting and more will all have an impact upon the feel of the space, so it's important that you choose carefully to send the right message about your company. 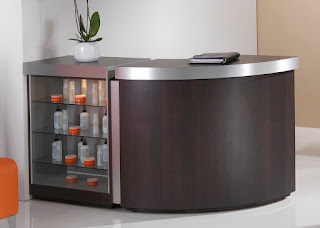 Reception desks come in all shapes and sizes: from small salon greeting points to large open workstations. The choice of your reception will be invaluable in determining the overall atmosphere of your welcome area, so it has to reflect the image that your business is looking to promote. 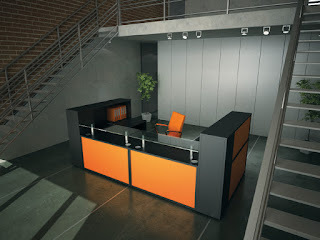 Some of our most popular ranges features modular units which allow you to design your own reception desk to suit your space. When coupled with the great choice of finishes on offer, these are flexible for any user in any space. 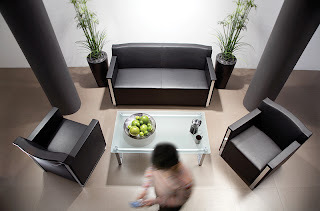 The seating that you put in your reception area also has a great effect upon how welcome people feel in your office. If guests feel that they can relax in comfort in your reception then they are more likely to not only be in a better mood around your offices, but they will also be more inclined to want to return in the future. With a choice of fabric finishes also available, seating is very flexible to suit the image you want to portray. Whether you want a clean cut leather image, or quirky colours, we can cater for everyone. Fabric and finish samples are always available to help you make sure you get the right colours to suit your reception - so get in touch and let us develop a reception package for you.